So it seems it’s actually very easy to cry over the death of someone you never met. But Robin Williams, I knew you. You first entered my life as Mork from Ork. You were probably the first male character I identified with as I, like many girls my age, had a pair of rainbow suspenders like you. I cannot think of any other male character who girls wanted to emulate, especially at a young age when idols like Barbie Dolls and Charlie’s Angels played such a big role. But every week you showed up, hilarious and wistful, and I loved you. Throughout the years, we ended up spending a lot of time together. With some exceptions, movies I’ve tended to watch over and over had you in them. 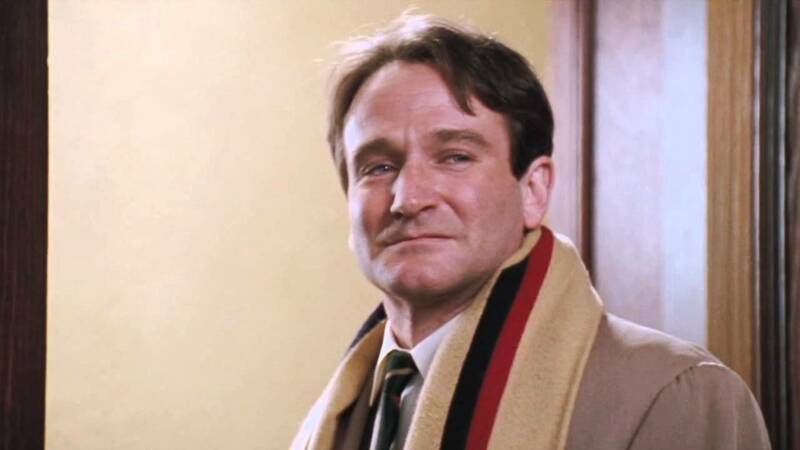 Whether you were the convincing wide-eyed manchild in Hook, the endearing Nanny we all wanted to befriend in Mrs. Doubtfire, the mentally ill Parry who manages to find love in the Fisher King, or the inspiring, kind and generous professor Keating in Dead Poets Society (which remains one of my favorite films of all time), you were a constant. In my twenties, I had a VHS tape of a Saturday Night Live 10 year anniversary show. I watched it religiously. I knew every line. I loved watching you circle the stage excitedly. You were hard to follow because your mind and mouth moved faster than those belonging to the average person like myself. It often took days for me to realize and appreciate what you said. You were pure magic. Your genius came to true life for me in law school, when I was fortunate enough to watch you do stand up to a very small crowd in downtown New York. It was a secret event and you were looking to try out new material. You were brilliant and irreverent and a Force. You were pure comedy and that doesn’t give you near enough credit. In retrospect, however, you made me cry more often than you made me laugh. You made me and so many others feel feelings, which isn’t always comfortable, but what a human and necessary release it is. You often communicated with a look, a gesture, and with a sadness your eyes seemed to know all too well. You were a full grown child, manic and full of wonder. You were larger than life yet you were fragile. You were a sad old man who was tired and tortured. You were everything. While I’ve enjoyed so many of your performances, your final scene in Dead Poets Society brought me to my knees. Regardless of how many times I have watched and rewatched it, even if it means just catching the last two minutes, it crushes me. I’m still angry at some of those boys who remained hunched over in their chairs, failing to stand on their desks, failing to hail you and realize what an extraordinary gift you were, failing to let you know how lucky they were to be in your presence. I think, perhaps, that that character, above all the others, was you, and that is why I always take this scene so personally. Your silent observance of these boys’ belated dedication to you is one of the finest cinematic moments I have ever had the privilege to experience. What more could you have said than “Thank you, boys. Thank you.” That said everything. Thank you, Robin Williams. Thank you.